For details of this week's services please see the Worship page. Each meeting begins with a brief opportunity for people to mention those things that they would like to be included in the prayers. Come along and enjoy our coffee mornings, every Friday 9.45am-2pm. Tea, coffee, hot chocolate, biscuits or homemade soup and roll. Part of the Places of Welcome network. More details from Mary Elms. Fridays 10-11.30am. For toddlers aged 0-5 years. Playtime, singing, praise and fun. Subscription £1.50 per family each session, including refreshments for children and adults. See attached poster for more details. 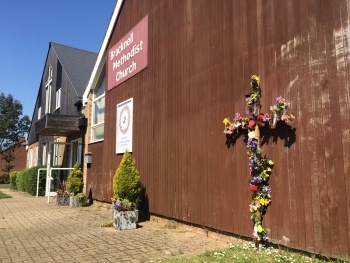 The latest edition of the Methodist Church E-News can be viewed here. Our Easter services began on Maundy Thursday with a joint service held at Crowthorne Methodist. This was followed on Good Friday with a short service in the morning followed by hot cross buns. Easter Day began with Breakfast Communion then the main service at 10.30. Members of our congregation brought along flowers to adorn our Lent cross. After the service the cross was placed at the front of the church for all to see. 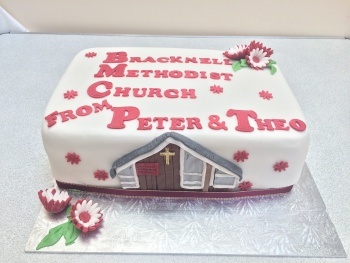 During the service we welcomed four new members to our congregation and a special cake for the occasion was shared afterwards. A regular event in the church calendar is Daffodil Day at Methodist Central Hall, Westminster. A group attended the 2019 event on March 4th. This year's theme was 'You will be my witnesses', the subject of Revd Dr Martyn Atkins address and reflected on by other speakers. Solos from Anando Mukerjee, Camara Fearon and musician Simeon Wood along with interviews from Pam Rhodes together with some wonderful singing by the congregation made a very enjoyable afternoon. Next year's event will be on March 6th 2020. 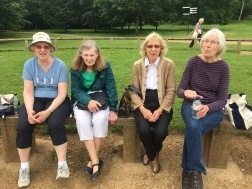 Several of our members took part in a sponsored walk round Virginia Water on Saturday June 2nd 2018 in aid of Action for Children. They are seen here at a refreshment stop. 2016 marked the 60th anniversary of the founding of our church in 1956. 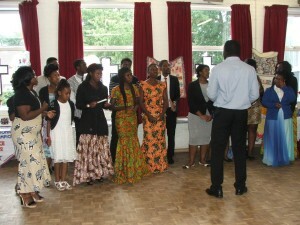 To celebrate a number of special events were held during June and July and these photos show a flavour of the occasion. The occasion kicked off on June 18th with an evening from the Camberley Band who played a selection of popular items and was very much enjoyed by those attending. We raised £266 for our building fund after sharing the ticket sales 50/50 with the band. 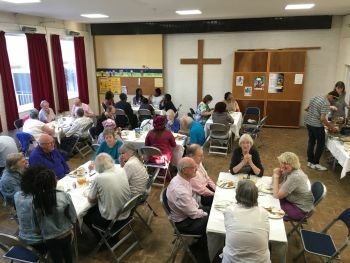 Saturday June 25th saw an All Nations Meal at our church where members brought various selections of food for us to enjoy. As well as excellent food it was an opportunity to meet some of our friends who had moved away in the past. The evening raised £200 for our funds. The following day we held our Church Anniversary service which was led by Revd Richard Barley, a former member of our church who went into the ministry after moving away. It was good to have quite a few of our former members at this service. The morning finished with a lunch for our visitors. Finally, on Saturday July 16th we held a garden party at the home of Tom, one of our organists. The weather was very nice and we enjoyed viewing Tom's beautiful gardens. Just over £400 was raised for our building fund. On Saturday September 7th 2013 we celebrated the opening of our expanded premises with an afternoon of fun for the local community, church members and our user groups. Councillor Tricia Brown for Priestwood and Garth Ward did the honours, then the choir led us in singing For the Beauty of the Earth and dedication prayers. Then we enjoyed refreshments and explored the new building. A bouncy castle kept our youngsters happy and a little later we enjoyed a barbecue manned by some of our members. All were impressed with the new premises. Displays were put on by many of our user groups, including the Scouts, Brownies and Cheerleaders, Craft Group, Tuesday Fellowship and U3A. We were also entertained by the U3A Singing Group and the Seventh Day Adventist Choir from Slough who gave a magnificant performance of spiritual music. Although the weather forecast was not good, it stayed dry and sunny for most of the afternoon. Then we were treated to a wonderful double rainbow during a shower while we were clearing up, the Lord truly thanking us for our Vision project. 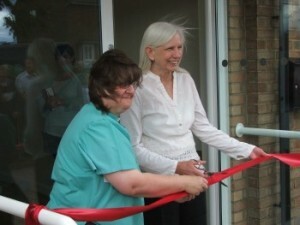 On the Sunday we had a rededication service for the new building which was led by our minister Jackie Case and Revd. John Hellyer, Chair of the South East District. Many of our former members and friends were invited to and attended the service. As well as rededicating the building we also dedicated the pulpit drop, pictured, that had been made to record the contribution of each of our members to the vision project. 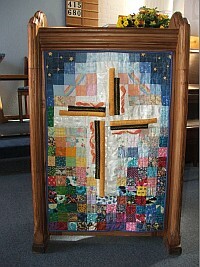 Each square of cloth represents one of our members and the contribution he or she had made. The choir sang the choral version of Let's Build a House by Marty Haugen which we had sung at various times during the development and very well reflected our thoughts that day. As we gathered before the service it soon became apparent what a difference the larger well-lit foyer had made to our premises, something that could not have been appreciated until now. This foyer will be the focus of many of our activities including our new Friday coffee mornings. More photos of the weekend can be found in our photo album. More information about our redevelopment can be found on our VISION page.